They say that "necessity is the mother of invention". But today, I would add that "to maintain all of our necessities, the world sorely needs and requires the greatest invention of all time - an autonomous government". The world is currently being introduced to autonomous cars and trucks. Many millions of miles have been logged by driverless cars and trucks. Tesla has already started to drive huge semi-trailer trucks across the country without a driver. The technology for driverless cars and trucks can be easily adopted to create a leaderless or autonomous government. Autonomous cars will reduce the crashes on the roadways, while an autonomous government will reduce the crash of our civilization and our planet and our species. Today, the people of this country and this planet are forced to endure a system of making the laws that we must all obey by a bunch of old white men in expensive business suits. Even this group is tyrannized by one or two individuals who control these few to consider only solutions to problems that have been predetermined and pre-cleared by special interest groups. Half of them end up in jail, and yet this is how we create the rules of law. But there is hope - we are now building the world's first artificial intelligence, a huge computer brain that can outthink all of these men in suits plus billions more of us on the outside. Solutions to problems can be delivered in seconds - not decades - and they will be fair and just because they will be derived from complete and total logic. Computers also cannot take bribes in their deliberation process. This is a new type of freedom. We're all familiar with freedom of the press, freedom of speech, freedom of religion, freedom to bear arms. We now need the Constitution to deliver a new freedom - the freedom from aimlessness. The autonomous government will bring us the common goals of preserving our planet Earth plus the survival of our species as well as all other living things. Today, we have no freedom from aimlessness because we are rapidly careening into oblivion, and there is no purpose for our lives or our nations. The only purpose seems to be to gain power and riches more than helping the citizens who those in power are sworn to serve. 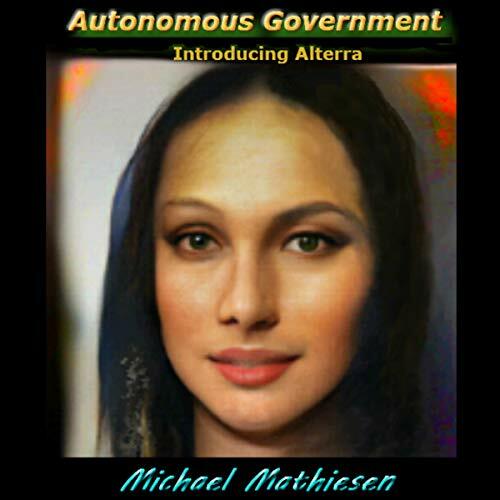 This audiobook also introduces Alterra, the face of the autonomous government. She will wander around in every community, learn about our problems, offer her support, and record the potential problems for the human beings living there. She will be more popular than any movie star, celebrity, or pop star. She is in direct communication with the IOPS, the Internet of Planetary Sustainability, the algorithm that enforces the rules for preserving the planet and guaranteeing our survival. But more than that, she will guarantee us all the freedom from aimlessness. The world will be set on a firm and sustainable path into the future.